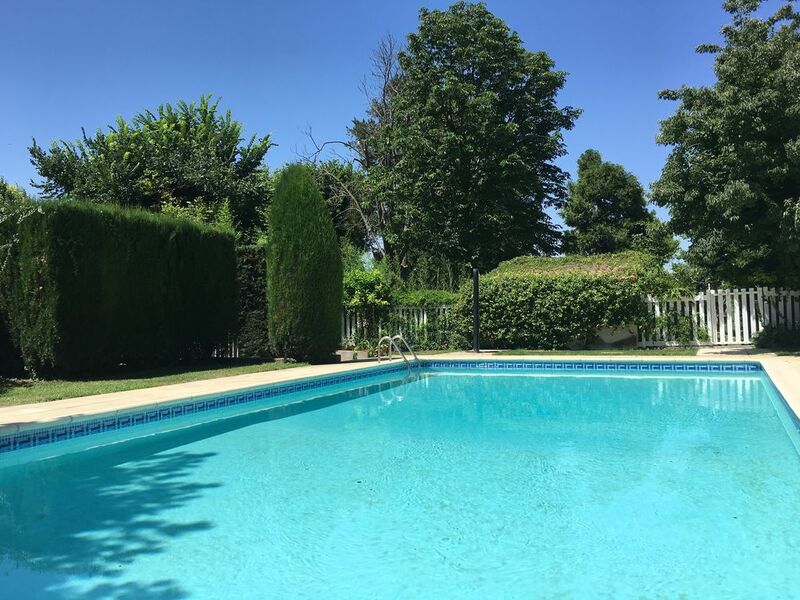 House in Beziers, Herault, Languedoc-Roussillon, France - Peaceful Location Ideally Situated For All The Leisures And Needs For A Wonderful Stay. Duplex set within a private Domain, gated community with a shared and secluded swimming pool, BBQ, tennis court and a large park with mature trees. The domain is set amongst the vineyards in a secured environment ideal for children. Close to the beaches, a stone's throw from the Canal du Midi and a 30 minute drive from The Languedoc National Park, while still being a few minutes from Beziers and its historical center, Shopping Mall, Cinemas, restaurants and leisure activities. Easy access from the airport, train and motorway. My family and I have been travelling and living in different countries for the past 20 years, and we can call ourselves citizen of the world. We lived in Asia, Greece, USA , France and in many other places. We are actually based in London, United Kingdom. The area is easily accessible with Béziers airport less than 15 minutes drive away, Beziers train station less than 5 minutes, and the motorway less than 10 minutes. We really like the variety of activities. One day, we enjoy the sandy beaches, and the next day we drive to the National Park of the Languedoc for a long walk in the forests. There are a lot of 1 day excursions, to discover historical sites or just the diversity of the countryside. In July, the festival d'Oc of Béziers and in August the Feria of Béziers are worth the experience. We really enjoy the secure and peaceful environment of the Domaine, amongst the vineyards, and still few minutes away from the centre of Béziers with its shops, bars and restaurants. Also we are few minutes away from many villages and their local markets. There is one shower room and one bathroom with bath with shower. One separate WC on landing. Bath towels are provided. Pool / beach towels are not provided. Please bring your own. Main living room, overlooking the park with direct access to the terrace. Fireplace for the winter nights. The dining area is part of the open and bright kitchen. There is a dining table outside on the terrasse. The Park is shared with the other houses. There is a private terrace with a table and chairs. There is a shared tennis court, with a first come first serve policy. the reservations are not possible. Golf of St Thomas within 15 minutes drive. The pool is shared with the other houses in the domain, the atmosphere stays very intimate. All personal belongings must be taken away when leaving the swimming pool. No use of the pool after 11PM. Outside: Mature gardens surround the house, which overlooks the pool. Large private terrace where you can enjoy your meals or aperitif. Shared pool with BBQ, Tennis court. Secured parking. The pool is secured by a glass barrier for the safety of the children. The domain is secured, allowing the children to run around and play. Utility Room: Laundry washing and dryer machines. Washing lines in the domain beside the ruins. Cleaning / Towels / Linen / Maid service: Bed linen and bath towels are included. Other: Second salon, with stunning view overlooking the Park, Pool and courtyard. A fantastic holiday home in peaceful shared historic complex. We had a lovely 2 week family holiday, with children aged 13 and 15 years, staying in Kathy's holiday home. The accommodation is spacious and overlooks the communal swimming pool within this historic domaine. Many of the other apartments within the domaine are occupied by permanent residents, all of whom were very friendly. The domaine has lovely grounds and the tennis court was great fun with fantastic views towards Beziers. The historic town centre of Beziers is only a 5 minute drive away and there are lots of other interesting places to visit within a 20-30 minute drive. Our children really enjoyed kayaking down the River Orb, the Feria in Beziers and water jousting in Sete. Communication with Kathy was easy and the apartment had everything we needed and was as described. We would love to return sometime! Thank you very much for your review, it makes me so pleased that you enjoyed your holiday. Heerlijk terras bij het huis. En in het huis is alles aanwezig wat je nodig hebt voor goede vakantie. Thank you very much for your kind review, we hope to welcome you and your family very soon in Beziers. My husband and I had a lovely time. We loved the proximity of the countryside and the town center. Had a great holiday with a lovely location. The accommodation was perfect for us as it was close to a lot of places we wanted to explore. Nice and quiet location with friendly people as neighbours. Thank you very much for you comment, I hope to welcome you very soon again. We had a wonderful time on our holiday - this house has everything you need for a relaxing holiday and we were very comfortable. The owners have very thoughtfully furnished the house and considered all the things you will need on holiday. The pool and tennis are excellent and the neighbors I very friendly. I love the mix of old and modern - especially the area to hang your washing by the old ruins. We are returning this year! Thank you very much for your kind words, I am very pleased that you and your family enjoyed the Domaine, and very happy that you chose our property once again for your summer holidays. Lovely location for a holiday! We're just back from our two weeks in your lovely property and wish we could have stayed longer. It was a perfect base from which to explore this vineyard-rich area of France. We found sandy beaches within easy driving distance, lovely ports, delicious food and wine and walks along the Canal du Midi - an ideal place to unwind. The children loved playing tennis and swimming in the pool. Facilities were great, upstairs got hot at night, so the fans were put to good use. The boys went karting at Serignan, waved off the Tour de France competitors at Carcassonne and paddle boarded at Portiragnan. We barbecued, walked around the gardens and really relaxed. Thank you! Sérignan beach is approximately 10 minutes, easy access by a country lane, enables you to avoid the summer traffic. Valras beach, Portiragne, Pézenas are all easily reached by car. Close to the Canal du Midi 500m; possibility bike ride along the Canal. 15 minutes from the airport Aéroport Béziers Cap d'Agde. 5 minutes from Beziers train station. 10 minutes from the A9 Motorway, exit BEZIERS CENTRE. GPS coordinates 43°19'12" N, 3°14'37" E. Car rental available from airport and train station. Close to the Canal du Midi (500 Meters) and The Languedoc National Park, while still being a few minutes from Beziers and its historical center, shopping mall, cinemas, restaurants and leisure activities. Booking Notes: 25% deposit on booking. The remaining payment is due 30 days before departure and includes a refundable £250 security deposit. Changeover Day: Saturday or Sunday during high season, possibility to be flexible during the low season. Check-in : after 2pm. Check-out : by 10am.